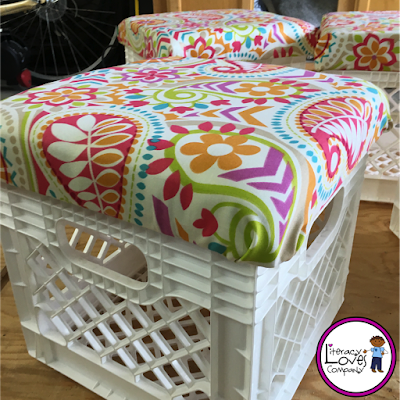 If you've been anywhere on the internet you know what a crate seat is... an ingenius combination of crate for storage and cushioned top for sitting. They are a perfectly clever addition to the classroom. 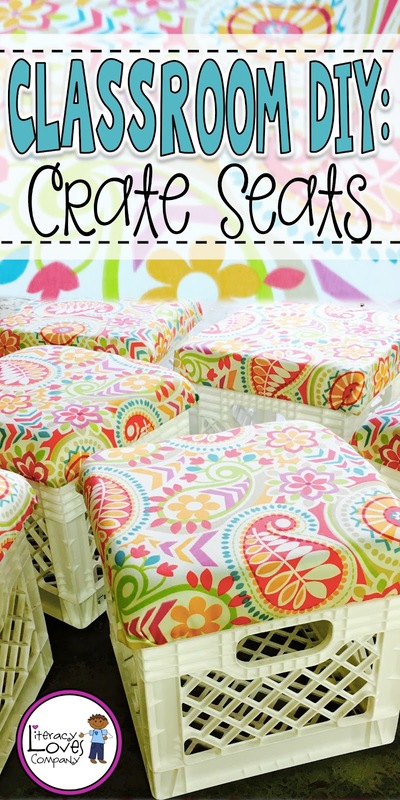 Although I've always admired them, I never really had the need for these stools in my own classroom until recently. Right before spring break my 4th grade students and I did a one week "trial" of flexible seating. It was a wonderful way to see if flexible seating was going to be beneficial for my students and do-able for me. For 5 days, we adjusted our tables so that we had 2 standing tables, 2 floor tables, a stool table, and a regular table and chairs. Throughout the week, the stool table was by far the most popular! At the end of the week, students wrote to me and shared their experience. They also got a chance to privately vote on whether or not they wanted to keep flexible seating for the rest of the year. Overwhelmingly, students voted yes... thus the need for crate seats! This week was spring break for my school district, so I had a bit of time to take on a Classroom DIY project. The Great Crate Seat Construction project was underway! I bought my crates from The Container Store. They were $9.99 each, but are heavy duty. I purchased a sheet of plywood from Home Depot for $19. I love that Home Depot will cut the wood for you. That really sped up this project! I had the nice man at HD cut 14" x 14" squares for the seats. While I was searching for a heavy duty fabric to cover the seat cushions, I came across this pattern. It was love at first sight! The fabric was a little spendy, but all I could think about was how much joy I would get by seeing those colors everyday. I decided to buy the 2 in. thick cushion. There were other choices that were much thinner, but I wanted to make sure my kiddos were comfortable sitting on these seats all day. I ended up having to piece together some of the foam because I didn't have enough for 6 complete squares. I cut the pieces and, using some spray adhesive, attached them to the board. Once the fabric was on you couldn't tell that it wasn't one complete square. Yay! 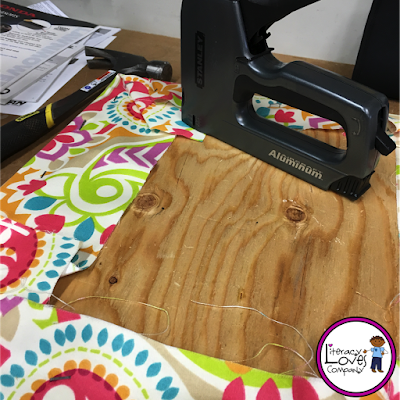 After layering the plywood, cushion, and fabric, I used a staple gun to attach the fabric to the wood. 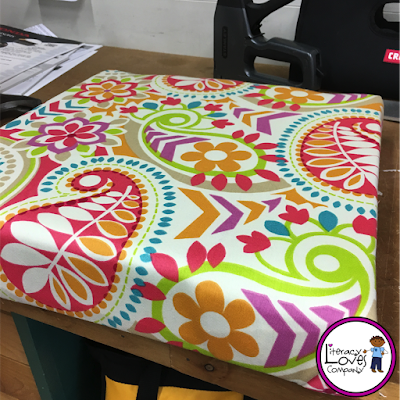 Here is one of the finished cushions. My technique improved after the first few. Once the fabric was attached, the hubby screwed a 12" x 12" square of wood to the back of the cushion. 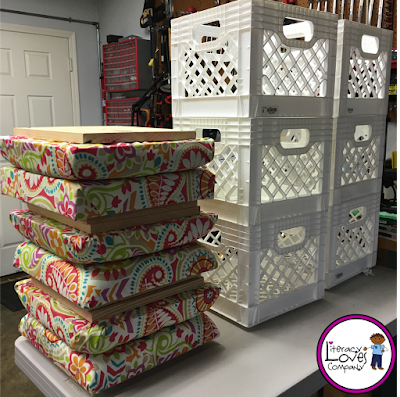 My milk crates don't have an inner lip for the cushion to sit down in, so the cushions will sit on the outer rim of the crate. This 12" x 12" will keep the seat secure on the crate. This pic shows how the seat fits on/in the crate. Voila! 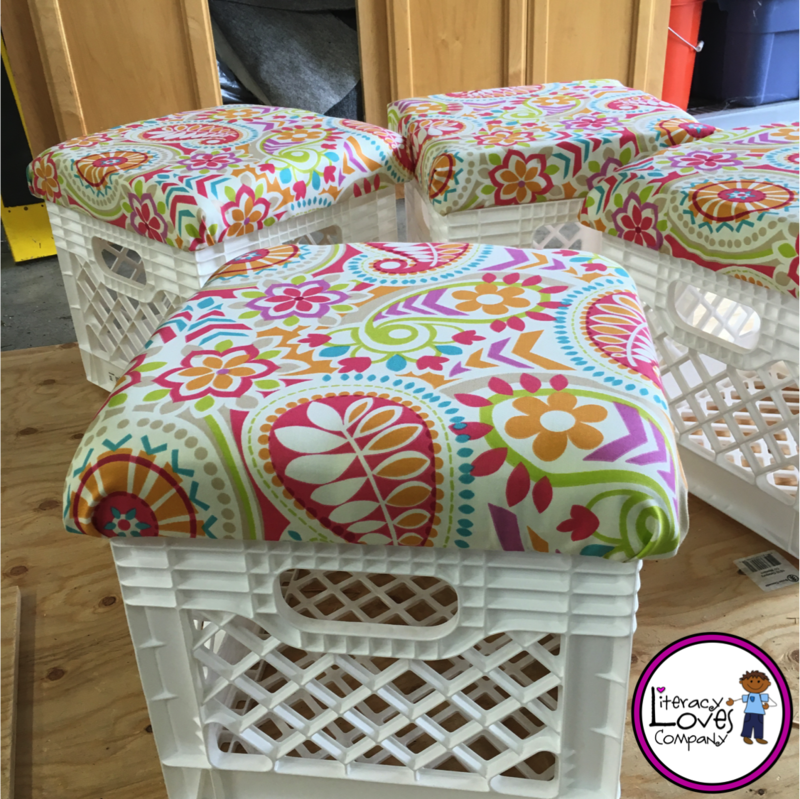 The finished crate seats! A little pop of spring for my classroom! They make my heart pitter patter a little bit. Here they are all stacked up and ready to take to school tomorrow! Another Classroom DIY project completed! I hope you'll stop back by to check out my next blog post! I'll be sharing my new classroom seating arrangement! I've been working hard this week to get my classroom ready for our "Foray into Flexible Seating!" and am excited to share the process we went through, seating choices, and lots and lots of photos! 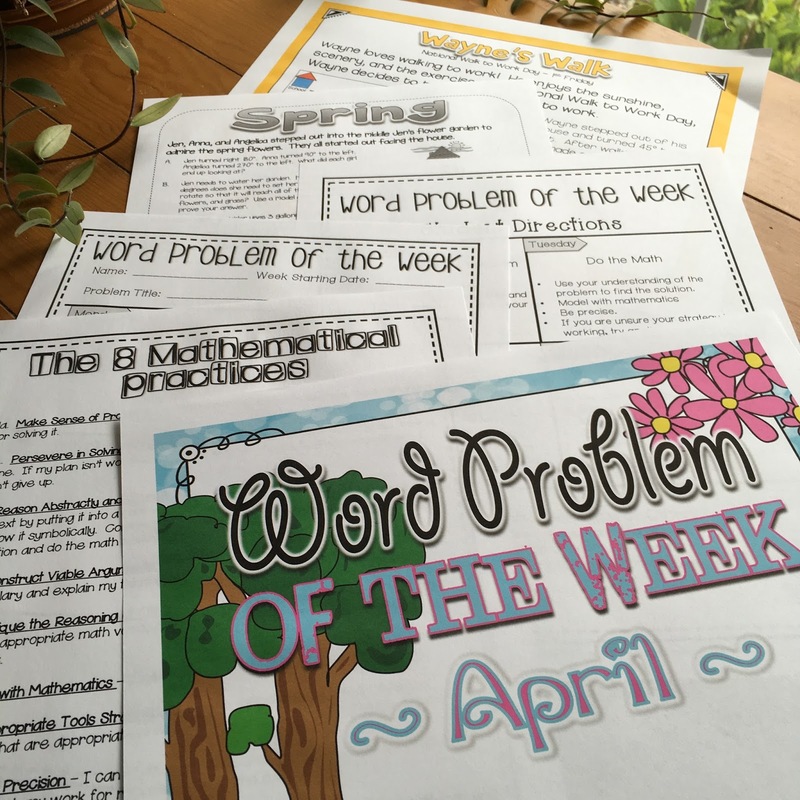 Another project I worked on and completed over my spring break is my seventh Word Problem of the Week set. If you aren't familiar with this resource, it is a set of word problems that supports the teaching, development, and use of the 8 Mathematical Practices while also supporting 4th grade CCSS. 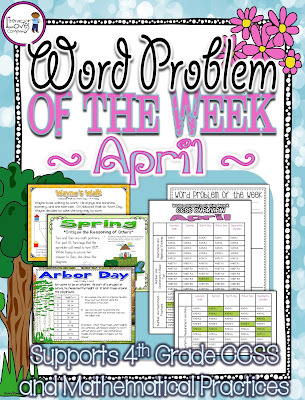 The resource includes a PDF and PowerPoint slideshow of 5 real world word stories/situations that connect to special days or events during the month. Each story has 3 mathematical problems associated with it (each varying in difficulty and skill), as well as an opportunity for students to "Critique the Reasoning of Others". There is much more to this resources so, if you are interested, please click on the product cover above to take a look at the complete product description, thumbnails, and preview! If you are not yet following me on TpT, you are missing out on an opportunity to get my resources for 50% off! All new products are 50% off for the first 48 hours! You could also get access to follower-only-freebies in your TpT inbox when I send out special notes to my followers. Click HERE to open my TpT store in a new window. Click on the green *Follow Me tab under my store name, Literacy Loves Company. Thank you for stopping by! 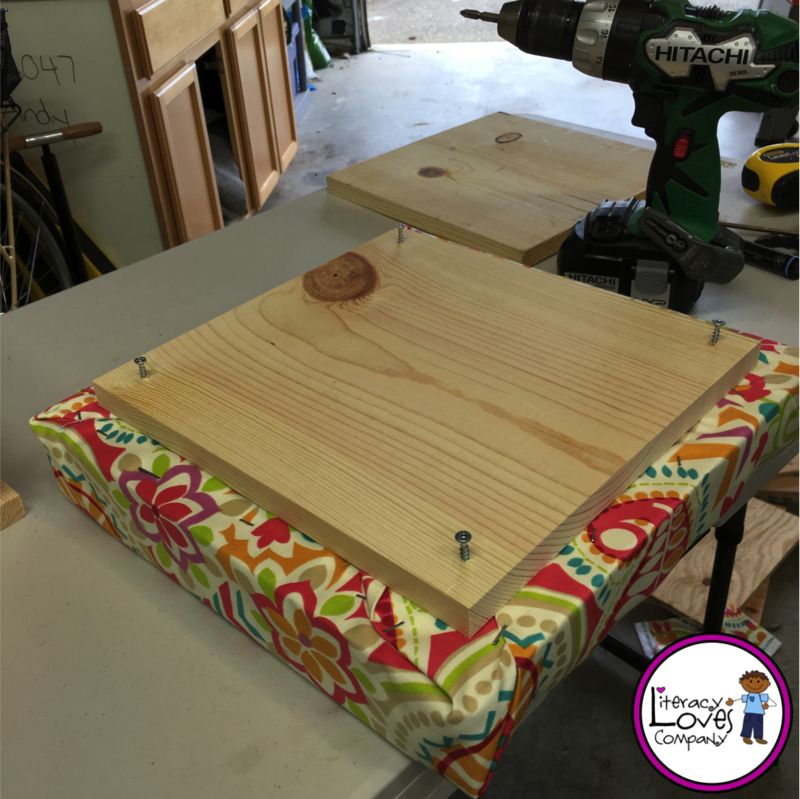 If you have an idea for another Classroom DIY project, one you've done or one you'd like to see done, please share it in the comment section! 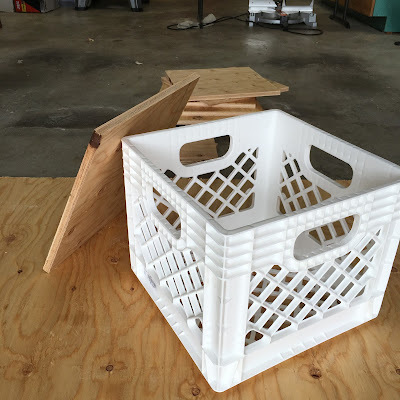 Also, if you have ideas for my readers on how to improve the seat crate construction, please feel free to share that also! I appreciate your comments and ideas! how much weight do you suppose they hold? I have high school students and would love to make something like this for my classroom, do you think it will hold students of that size? Hi Aimee. I sit on mine all the time and I've had staff members come in my room and sit on them. I don't think you will have a problem as long as you purchase the more durable crates. I got mine from The Container Store. They are a tad more expensive than the more flimsy ones you will find at Target or Walmart, but they are very strong. Mine still look good and are in perfect condition. Best of luck to you! Love, love, love these crate seats! Yours turned out great! Thanks for sharing the instructions & photos! How much did you spend in all? Hi! I spend about $150. The most expensive part is the foam, but I chose to go with the thicker option. I also chose more expensive fabric. You could cut the cost by using thinner foam and maybe look in the remnant section of the fabric store for less expensive fabric or reuse some you already have. I bought a yard and a half, if I remember correctly. It was plenty. Yes, thanks! So I'll need 2 pieces of wood for each seat. Got it. Thanks! Where did you purchase the foam from and what should I ask for when I go looking? What is it "called"? I got the foam from a craft store called JoAnn's. 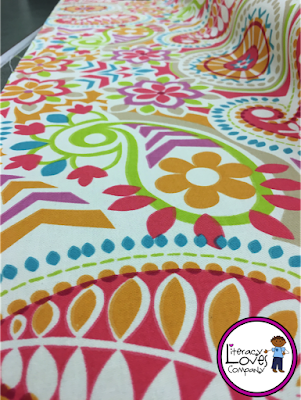 You should be able to find it just about anywhere you find fabric. I think it is called "density" foam or cushion foam. In the store I went to there is a huge section of batting for quilts, foam of all sizes, and stuffing for pillows. I found it in that area. I found precut slices at Walmart in a 4 pack that are 1 inch thick. You could buy a couple packs and double up the cushions for comfort. I got the fabric from JoAnn's. It is a craft store here in Oregon. It was in the upholstery fabric section. 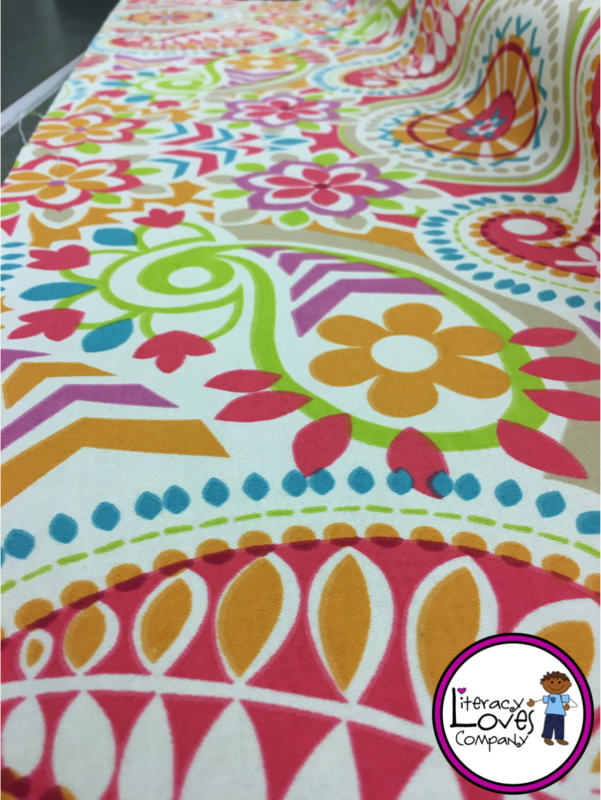 Do you remember the dimensions on the fabric to cover just one? I have visions of my wrappung presents and not cutting enough paper. I don't want to do the same thing on my gorgeous, but expensive fabric. Hi! I don't remember exactly, but the fabric overlapped the backing board by about 3 inches on all sides. 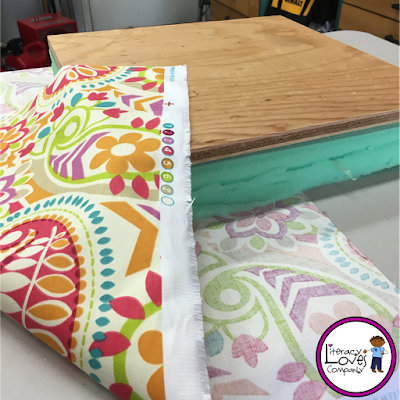 The backing boards are 14 inches + about 2 inches for the cushion width + 3 inches overlap. That would be about 19-20 inches squared. I hope that helps a bit. Thanks for visiting! Your crate seats are wonderful! I am wondering how they are holding up after use. Hi! I've only had them since the end of March, but the crates are like new. I'm glad I chose to buy the heavy duty ones at The Container store. I actually used them to pack up some of my materials as I was leaving for the summer. The cushions are also holding up really well. The fabric isn't quite as vibrant as it was when I bought it, but I expected that. The great things is that I can eventually replace the fabric if I want to. Thanks for visiting! Thank you! I fell in love with the fabric. After about 3 months it isn't as vibrant as it was when I took the pictures, but they are still a great pop of color in the classroom. I hope your students enjoy their new seats! I like that you could potentially join some of the crates together to make a little bench. Also, you could possibly work something with a piano hinge so the tops are attached. So much to experiment with... Maybe not for the classroom (I work with 1 year olds, and they climb EVERYTHING), but for my house it would be cute on my porch haha. I have been wanting to make these but I didn't want to have to buy crates. I have some of the milk crates that were left at our lunchroom at school. I couldn't figure how to keep the seat from sliding off but this is the solution!!! Thanks for sharing! How much plywood did you have to purchase? Sorry I didn't get back to you sooner. Yes, one was enough for me also. I still have quite a bit left over. Thanks for visiting and I hope you have a great back to school! Hi! I think it was 1/2 inch. What I know for sure is that it was very sturdy and didn't bend at all. The wood for the inside/smaller piece was a 1x12 cut into 12 x 12 squares. You could probably use the plywood, but we had the 1 x 12 already so that made it easy. Best of luck to you! 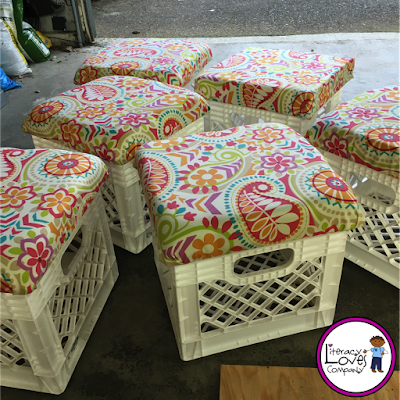 I'd love to see pics of the crate seats when you are all done with them. I will be teaching 6th grade self-contained. We have high school/college type chairs. I also have a large library. I have 4 hokki stools and a standing desk. I am trying to figure out how and if I can do flexible seating. Suggestions? How have these held up? I was wondering if your fabric has gotten dirty? The stools have held up wonderfully! 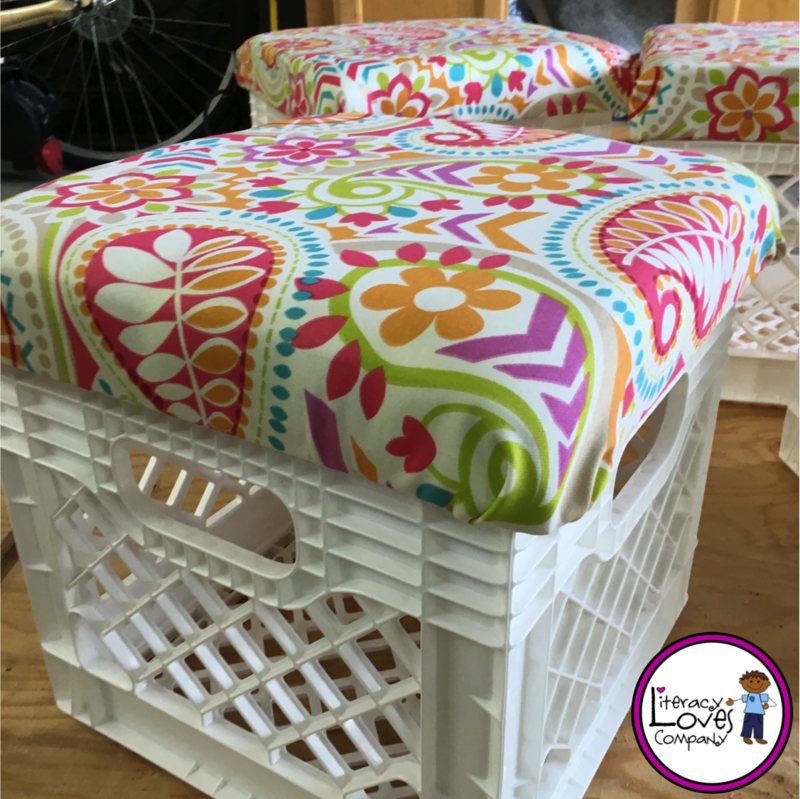 The crates are still in one piece and the cushions haven't worn down from use. Sadly, the fabric has gotten dirty and is much less vibrant. :) But that is to be expected after a year and a half. The great thing is that I can take it off and either try to wash it or replace it. I'm thinking of replacing it since I'll be moving to a new classroom and grade level next year. Hi! 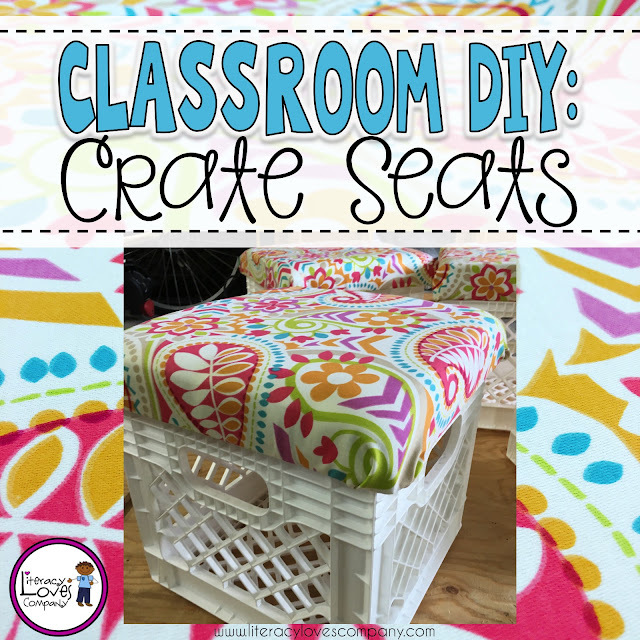 I'm looking at making these for one flexible seating option in my classroom this year. Before I commit to this, though, I am curious what you think the benefits are. Do you use them for storage during the year, and if so, what do you store? 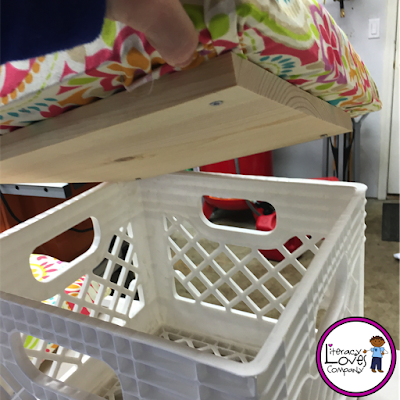 Are they easy and safe for kids to move on top of tables at the end of the day?